Spring saw Wonderment Walk Victoria participating in the Olivia Newton-John Cancer Wellness & Research Centre’s annual Wellness Walk and Research Run (WWRR). The fun run and walk raises awareness and vital funds for patients to access world leading wellness and supportive care programs. On Sunday 17 September over 2,000 people descended on La Trobe University Bundoora to celebrate and raise a massive $400,000. To add an injection of art and science fun into the day, Wonderment Walk created a social media activation with our Run for your Life rhinos. WWRR participants were encouraged to take a ‘selfie’ with the rhinos near the finish line, upload to Instagram and use the hashtags #wwrr2017 or #makeyoursetpscount. 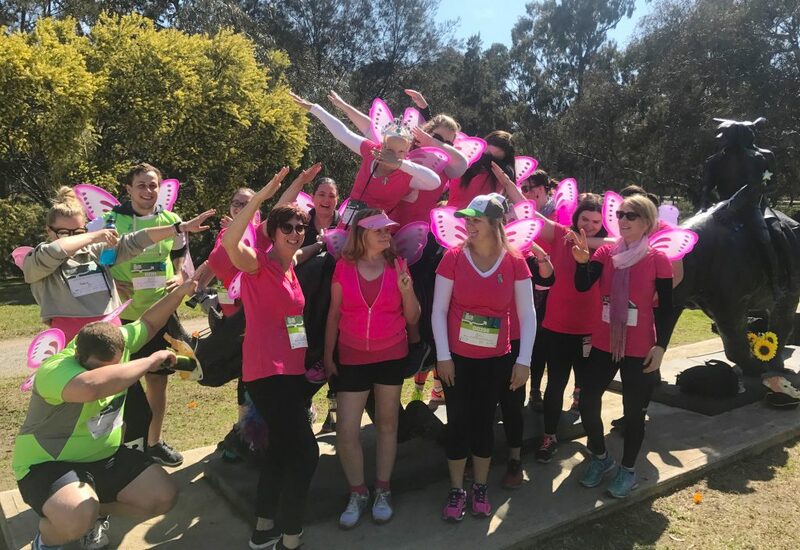 Later, the WWRR Wellness Committee would sift through all of the entertaining photos, choosing their favourite individual or team to receive a Wonderment Walk Victoria gift of $1,000 towards their fundraising amount for the fun run. Feather boas, novelty sunglasses and fairy wings were provided as props, our rhinos have never seen such glamour! Kimmy’s Angels were the deserving competition winners, their hot pink army produced a photo full of empowerment and positive energy.